BuySell Volume is an indicator that approximates Buy and Sell volumes based on price movement. applied_model: Choose the applied model. In low reversal mode, price is considered receive low bearish pressure during bullish candle's creation (high bearish pressure on high reversal model. In other words, Bullish Marubozu candles has really high Buy Volumes in low reversal model than in high reversal one. 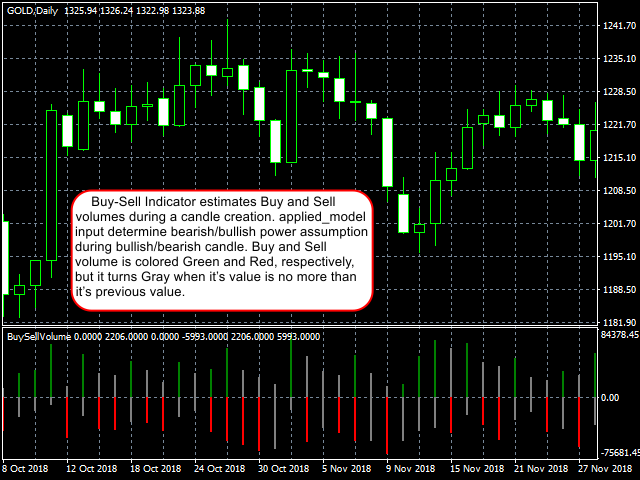 Buy and Sell Volume: Determines how many Buy and Sell volumes during a creation of a candle. Please refer to this value when you want to know exactly the volume for it. Assigned color for Buy and Sell Volume are Green and Red, respectively, but turns grey when it's value is less than previous Buy/Sell Volume value. BuySellVolume, Value 2 to 4: Dummy outputs for depicting indicator.